Thinking about the effort, there were some ergonomic problems that made this more of a struggle than it could/should have been. For both the sawing out and the excavating steps, some means of clearing the dust is a must so I can see the layout line I’m trying to work to. When I was sawing I got by with puffing the dust away, doing my Thomas the Tank Engine imitation (“I think I can…”). That worked, but I was on the verge of hyperventilating, to say nothing of it stretching my ability to do more than one thing at a time. Another problem was working height. I had that sorted out OK for the sawing with the v-block setup I made, but I didn’t really have anything worked out for the routing step. And finally the lighting was an issue, especially when routing out the cavity although it was an issue with sawing too. My eyesight has never been what you would call good, and as I’ve gotten older my prescription won’t work up close. I wear multi-focal contacts, which lets me get by for most things, but I still end up needing reading glass for detail work in the shop. And a 5X Optivisor for this kind of work. Sigh. I remember painting the buttons on cast lead Napoleonic solders that were only 3/4″ tall in high school. 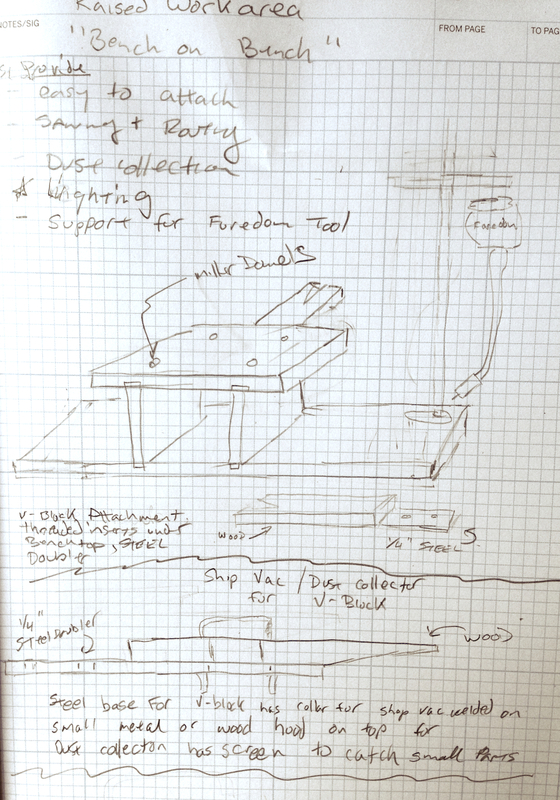 So here is what I’m doodling as a solution, a bench riser that incorporates solutions for most of these problems. Figuring in the height of my workbench and stool, I need a 12″ lift to get the work to the right height. The v-block for sawing will be removable, with a steel sub plate to attach it to the underside of the riser top and a fixture to hook up a shop vac. I haven’t figured out dust collection for the excavation part yet, although I have a couple of ideas about that. The choices are either a different base for the Foredom that includes dust collection (like the MicroFence Micro Plunge base), or if I can get the kinks worked out on the base I have I’ll make up a positionable hose holder. The lighting I know what I want to do, but I haven’t found an affordable solution. What I want is a pair of gooseneck lights that attach to the sides of the riser, like the ones below from MSC. 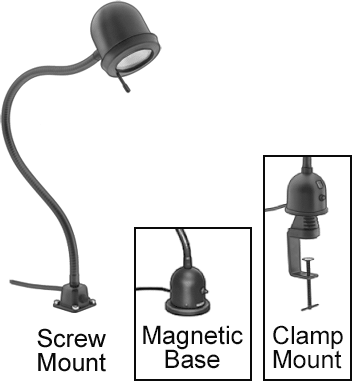 They have screw bases, a 30″ flex arm and a 700 lumen halogen bulb. But they are $130 each too. I want a $20 solution. 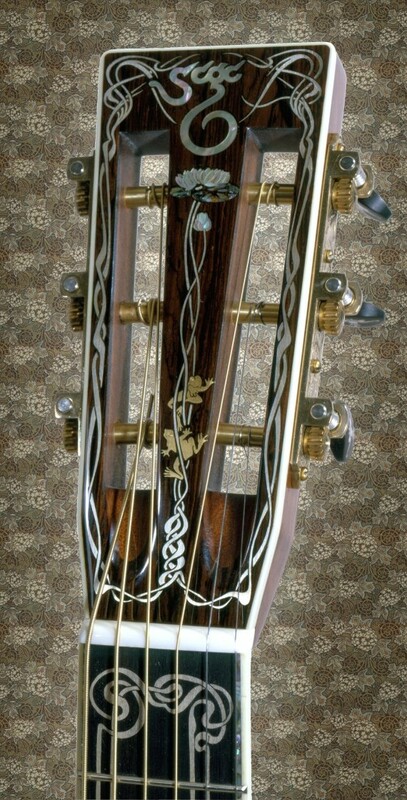 I think something like this would solve most of the ergonomic problems and make the inlay process go a lot smoother. 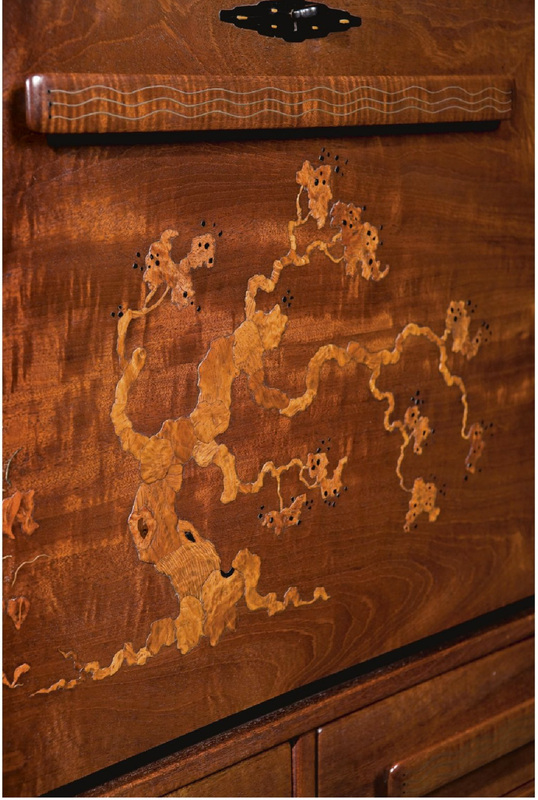 I don’t plan to pursue this immediately, but certainly before I do anything with inlay again. 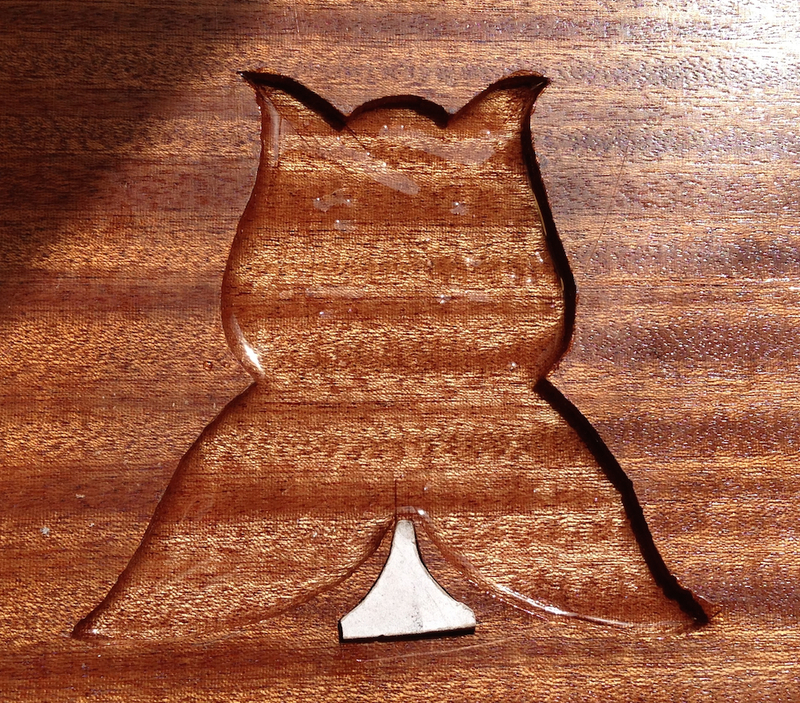 In fact, the next time I try to do inlay it will be on a real project, so I’ll want to make sure it comes out as nicely as I can possibly do. Probably fairly soon, but today I have a box of glass that arrived that I need to turn into the panels for the Thorsen cabinet. After the aborted first attempt at excavating the inlay cavity, I decided to try again. I applied a couple of coats of shellac to seal the wood, hoping that it would make the layout lines more visible — it didn’t. Or at least not by much. I followed the same process as last time — glue the inlay down with Duco cement, trace around it with a fresh Xacto knife, pop the inlay off and excavate with the mini router. 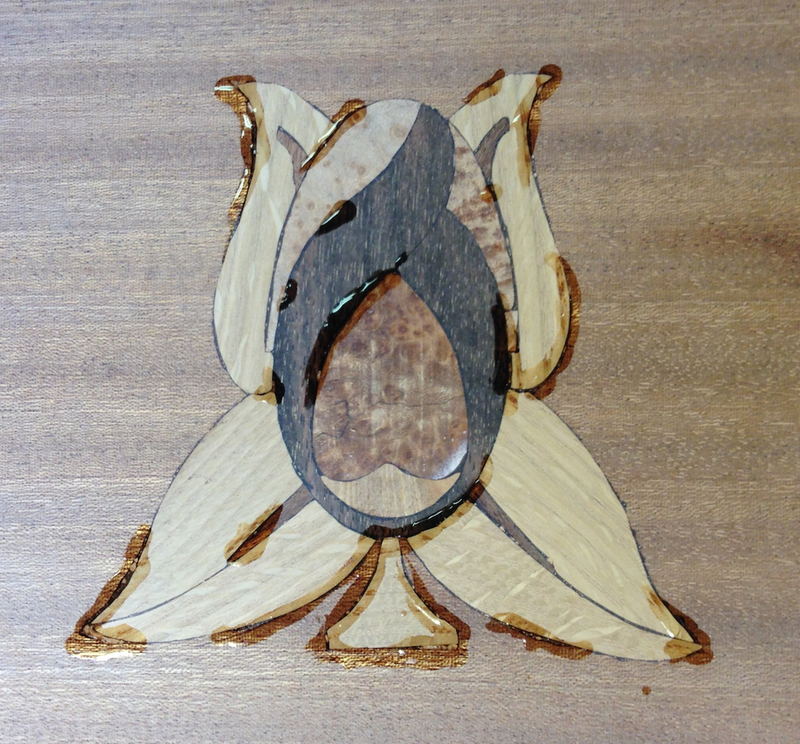 The hardest part of the whole inlay process was accurately excavating the cavity to fit the inlay into. I expected it would be sawing the parts, but I was wrong. What made the inletting difficult (aside from the fact that it’s 100 degrees in the shop) is a combination of tool problems and ergonomics. I’m having issues with the mini router base not holding it’s position and a few other small issues. I’ve been emailing with William Ng, and I’m sure he’ll get it sorted out for me. The ergonomics are a little more of a problem. I didn’t have a good way to get hold the part at the right height, I didn’t have a good solution for clearing the chips so I could see the line, and the lighting was bad. I made do, and I have an idea for how to make that better next time. In fact, I think between getting the tool and ergonomics dialed in I’ll have a much better result and more relaxing time of it overall. The actual process of inletting was a matter of “hogging” the bulk of the waste out with a 1/8″ bit (if you can consider it “hogging” with a tiny router bit). I tried to stay about 1/16 off the line as I was hogging out. Then I switched to a 1/16″ bit and snuck up on the walls, watching for my scribed line to disappear. Sometimes the line would disappear, but when I looked closely the surface where the wood was scored would come off, but lower in the cavity the wall would still be sticking out. 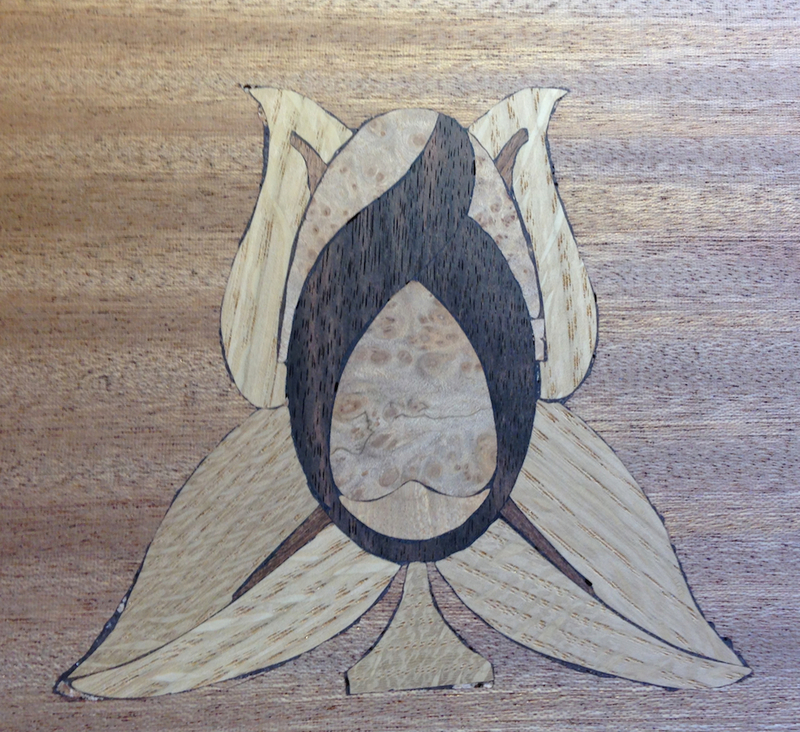 So the process included a lot of fine tuning until the inlay seemed like it would snap in. After a couple of rounds of back-and-forth fine tuning (and the requisite amount of overshooting the line, and only a moderate amount of swearing) I had an inlay-shaped cavity I thought would work. I filled the bottom of the cavity with Superglue and pressed the inlay in. The little base had broken loose from the main part, which wasn’t a problem. I put a sheet of waxed paper over the inlay, added a caul and clamped it in my leg vise for two hours. It was with a fair amount of trepidation that I pulled it out to check. I was surprised at how deep the inlay was in the wood. 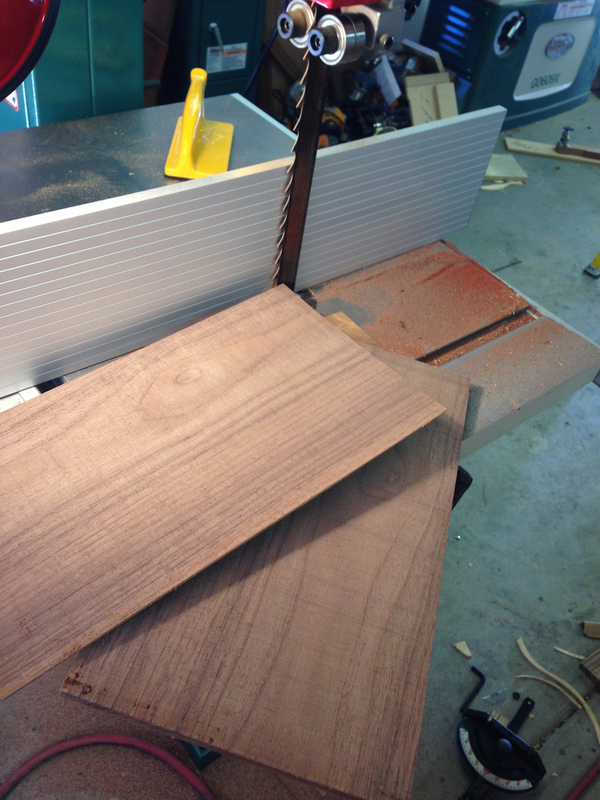 I’d sawn the veneer about .125″ thick, and only routed the cavity .075″ deep, but it was almost flush. 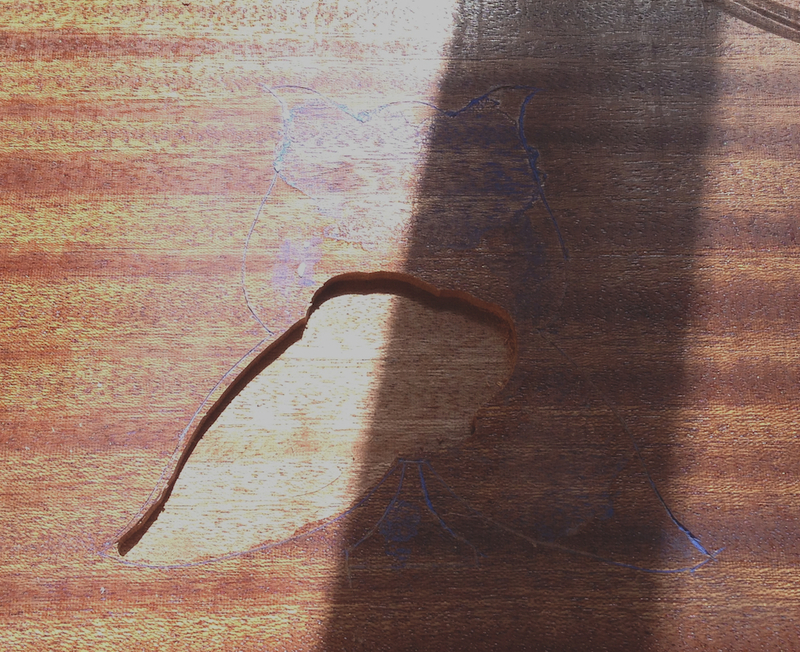 I think this was from sanding the back of the inlay assembly to remove glue, I’ll have to watch that in the future. I started flattening this with 100 grit glued to some plywood scraps. 60 grit would be better, the 100 loaded up pretty quickly. I had to sand the inlay flush, sand off the glue, shellac and paper. Once that was done I checked for any pinholes and gaps and filled those with Superglue. Done! Finished with a light coat of Linseed oil. So I’ll give myself a C+ for effort on this. It’s obviously got some problems when you look at it up close, although it isn’t a complete disaster. The problems I see are almost exclusively with the excavating of the cavity. A little neater job on that, and this would be presentable. I can see some problems with the sawing too, but surprisingly then almost disappear in the finished piece. And I’d I’d inlayed this into a dark wood the gaps around the edge would be nearly invisible. 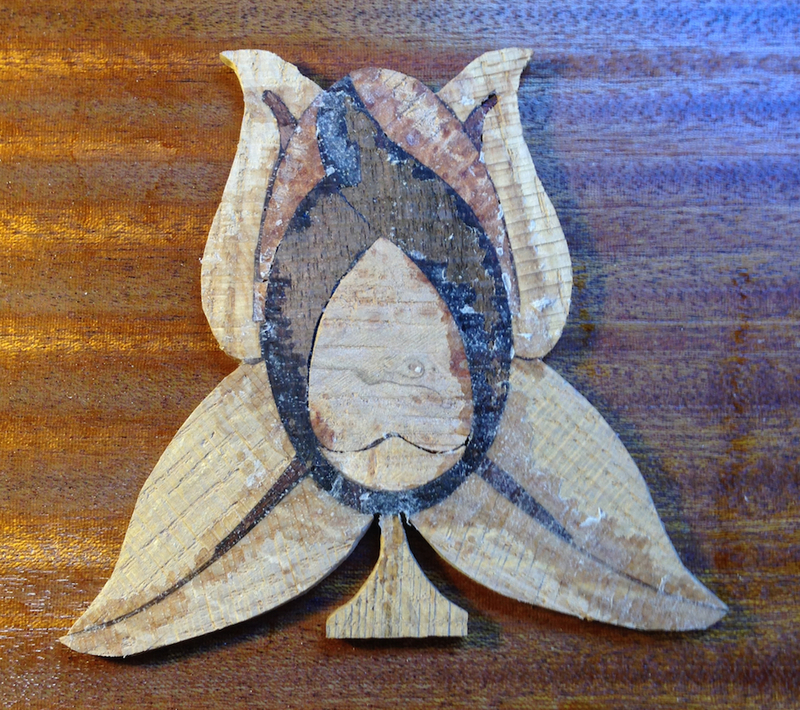 Yesterday I continued with my inlay experiment. I sawed out the rest of the pieces of the Stickley design I’m using. The part of the process I was most worried about was the sawing, which turned out not to be that big a deal. I’m not saying that my cuts are great — they aren’t — but I can see where with a little practice I will be able to get the hang of sawing with a jeweler’s saw. I was using a 3/0 64 TPI jeweler’s saw blade made by Flying Dutchman. It’s .009″ thick and .017″ wide. It cuts nicely, but I snapped bunches of blades, mostly trying to get the tension in my Knew Concepts saw frame right. I have to say, I think the quick release mechanism needs a little more design work on that saw. The tension adjustment also affects how much of the blade the saw will clamp — if you can’t repeatedly clamp that same amount of blade every time you can’t repeat the tension mechanism. And the difference between “enough” and “too much” tension with the 3/0 blade is zero. So I switched over to a #3 45tpi Olsen blade I had on hand — it doesn’t cut nearly as well. I could tell the difference, it seemed to “catch” or “bind” much more easily. I was surprised I could tell so much difference. I did order a half gross of the #3 Flying Dutchman blades from Mike’s Workshop so I’ll have them on hand to try next time. After sawing out all of the pieces I did a bit of filing to improve the fit between adjacent pieces. 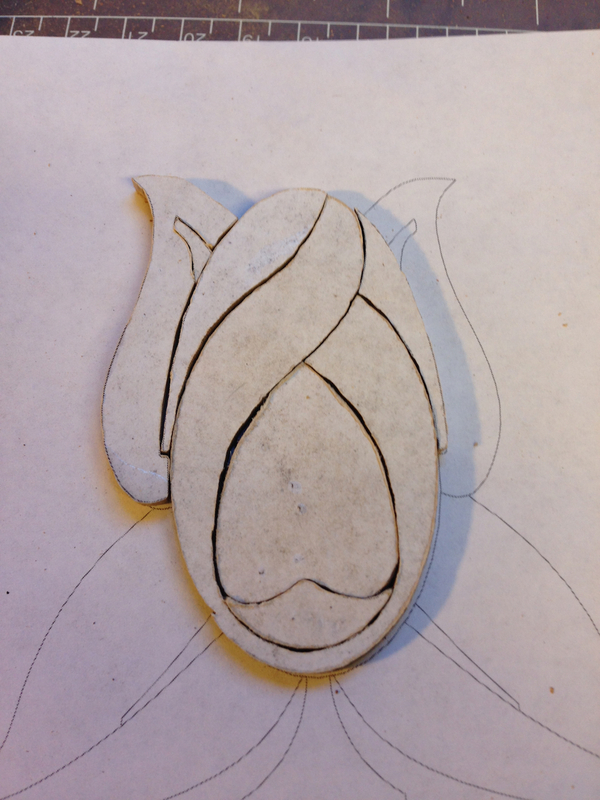 Then I laid out a copy of my pattern, covered it with waxed paper and started super gluing the pieces together. The glue I have is a little too thick — I need a lower viscosity superglue, something else for the shopping list. 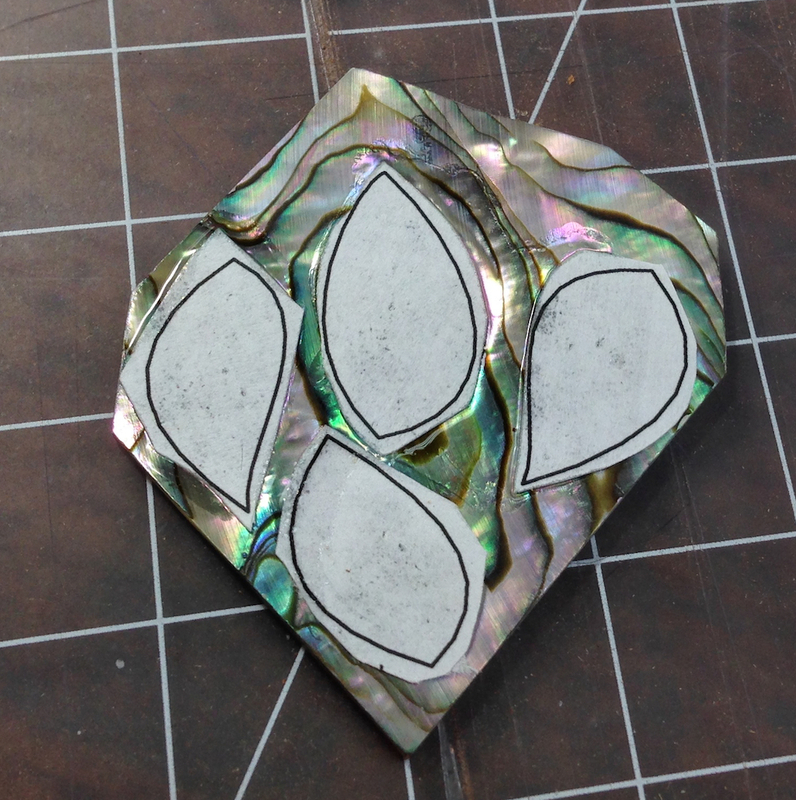 Assembled inlay, pieces superglued together on top of waxed paper layered over a copy of the pattern. Then I peeled the inlay off of the waxed paper and cleaned up the back with a razor blade. It doesn’t look too bad. 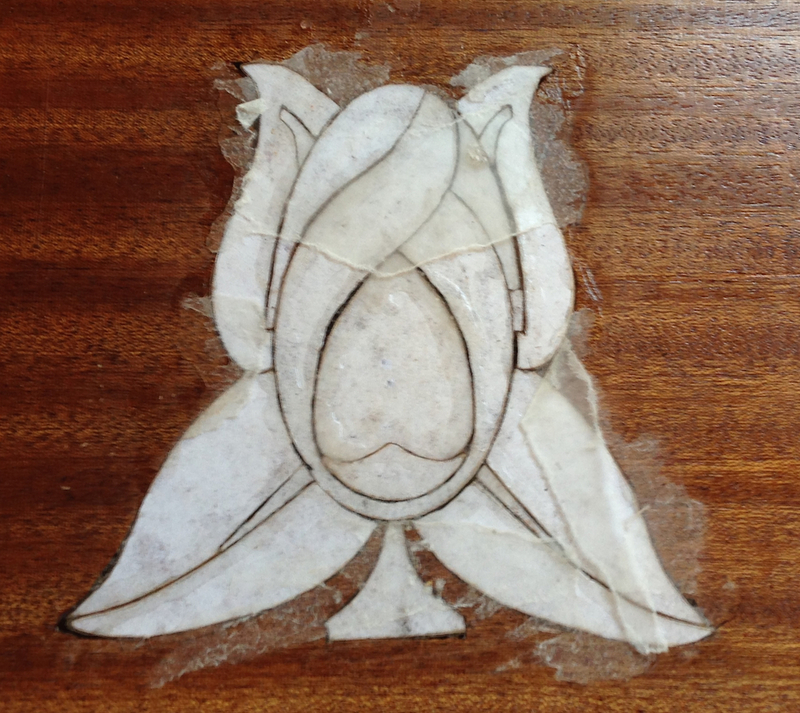 Back of the inlay after gluing up and scraping off the bits of stuck waxed paper. I put a coat of shellac on the board I’m inlaying into, this was a suggestion from one of the videos I watched. I glued the inlay to the base with Duco cement, scribed around it and then popped it loose. I worked some blue child dust into the cut line. But it’s not really clear enough — in part because the grain of the wood is picking up a lot of the chalk dust too. Next time I’m going to put more shellac down to try to close up the pores in the wood. It will get sanded off (or washed off) later in the process – it’s not the final finish, just part of the process. I’ll try it without the shellac some time too, but the Sapele I’m using has a pretty distinctive texture that grabs the dust. 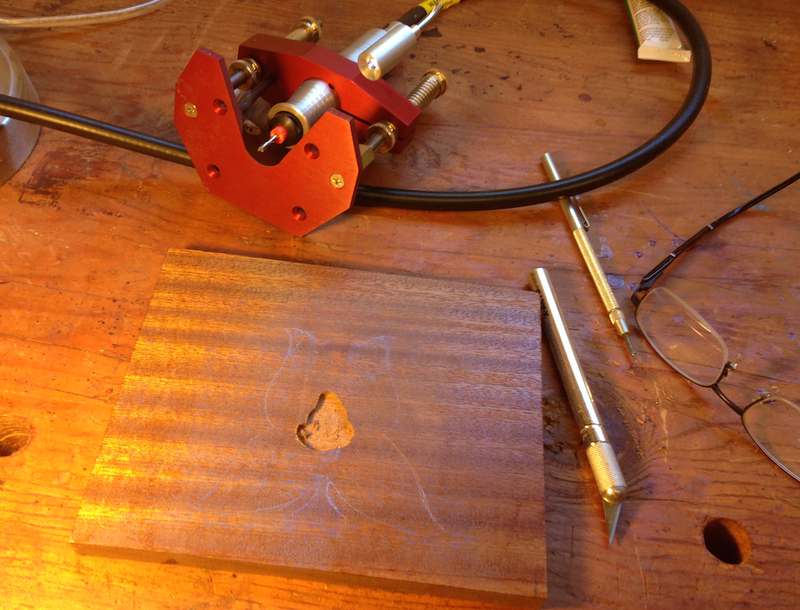 Then I started routing the cavity with my new tool from William Ng. My first impression of the tool is mixed. It’s beautiful and nicely made, but one of the two lights on it doesn’t work. In fact, I don’t care for how the lights are designed, the internal mechanism seem pretty fragile. The one that works isn’t very bright either, and they don’t stay positioned. My other complaint is that trying to route to .100″ depth causes enough vibration that the depth screws come loose and the cut drifts deeper. Routing to a shallower depth – say .080″ – seems to solve this. 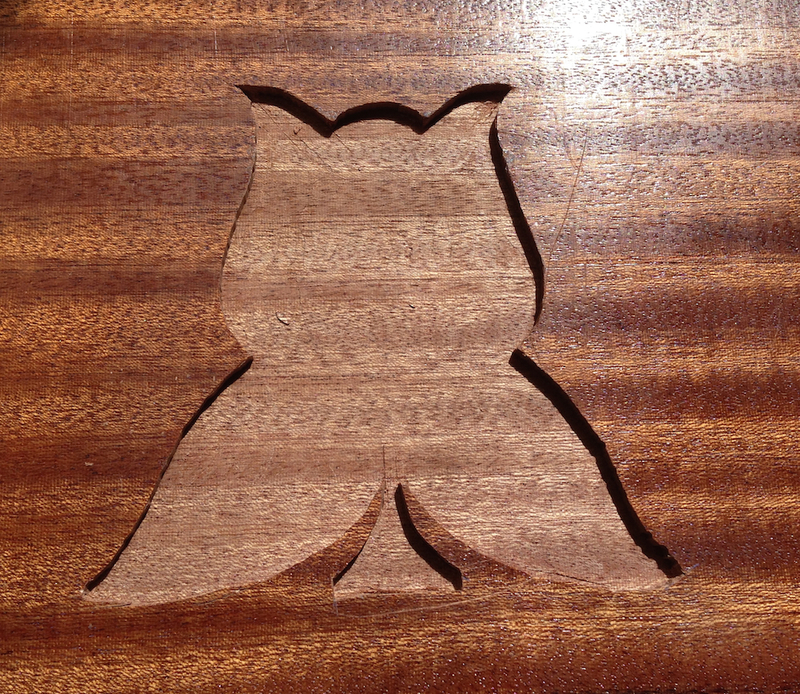 I guess inlay is only set in about .060″ normally, so maybe I’m trying to do too much with the tool. If I absolutely need to go to a deeper depth I’ll have to use my trim router to hog out the waste and use this just for sneaking up to the lines. Starting to clear the waste with a 1/8″ router bit. The router base has a setup to connect an air line to clear the chips away — I need to get that set up before I do this again because it was impossible to see what I was doing. My work height was wrong, the lighting was bad, the cut kept drifting deeper and the chips were in the way. In short, excavating the cavity gave me problems. The theory is that you should excavate the majority of the waste, leaving a small bit next to the scribed line, then go back (maybe with a smaller bit) and sneak up to the line using tiny passes. Needles to say, I overshot the line in one spot and decided to scrap this part and re-do the inletting. But even with the disadvantages above, in most places the edge was coming out nicely. I’m pretty sure I’ll be able to do this part of the process next time, I already prepared another base with a couple of coats of clean shellac and will glue the inlay down before I head over the hill for work. Maybe I can try excavating again one night this week – but first I need to work out the lighting problems and set up some sort of raised work area so I can see what I’m doing. I messed up the excavating, and will do that part over on a new blank. 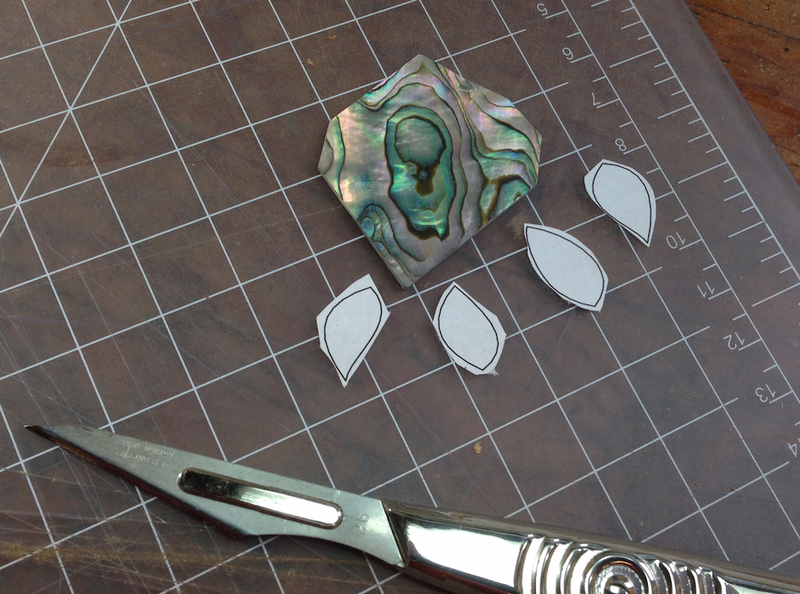 So I’ve blogged several time recently about my interest in learning to do inlay, and especially “bolection inlay” or “Greene & Greene style inlay”. Given that I recently added a bandsaw to the lineup of finger-chewing devices in the shop I thought it was time I gave inlay a try. 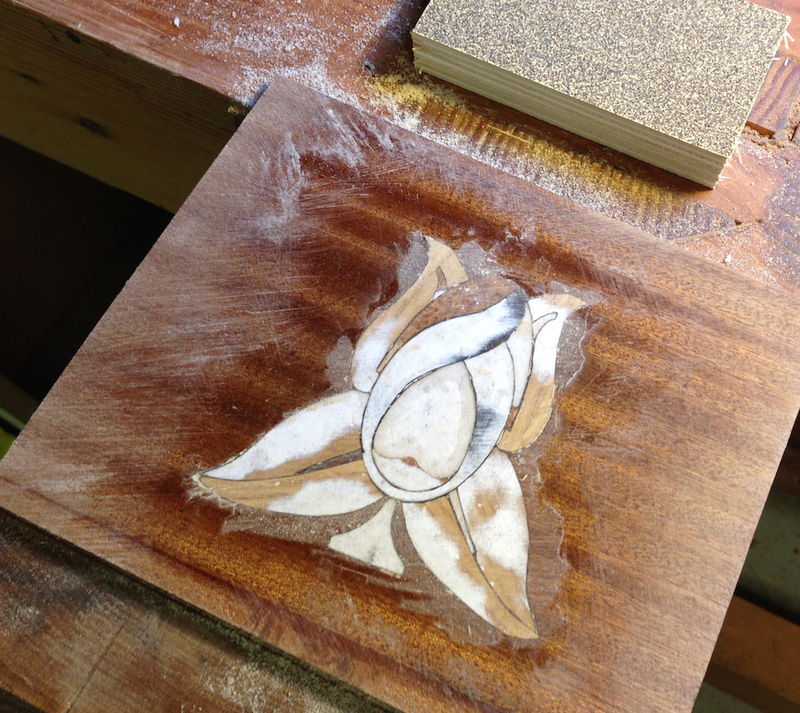 I’m starting with a traditional “flat” inlay, where it will be finished flush with the surface. 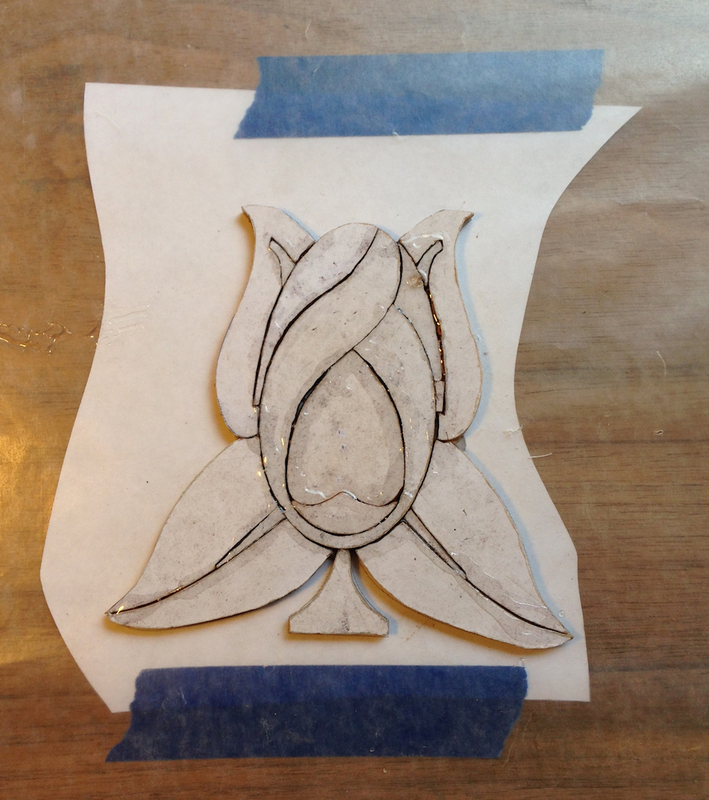 The raised and carved style that the Greene’s used has some extra steps and I want to get the basics down first. 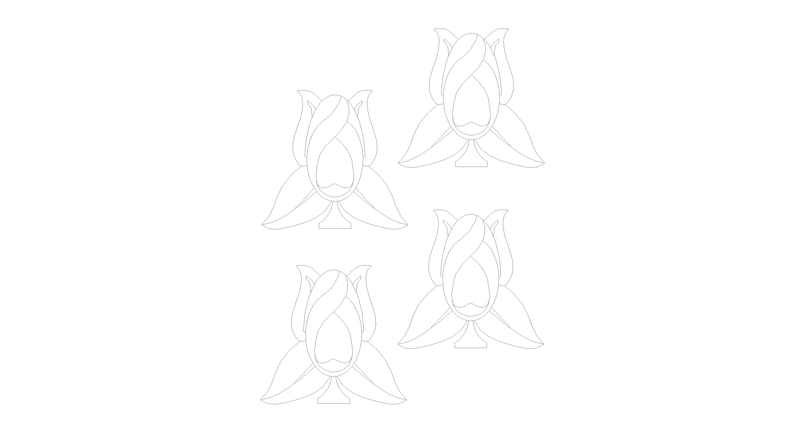 The design I’m using is a Stickley pattern, if you click on the image below you can download a full size pattern sheet as a JPEG image. To begin, I needed some different materials for the inlay itself. I fitted the scary resaw blade into my new bandsaw and tried it out. It certainly cuts through anything I threw at it without any hesitation, but the surface it leaves isn’t nearly as nice as the “Woodslicer” blades from Highland Woodworking — I’m going to order one of those this week. In some materials (like the White Oak) the cut was reasonably smooth. In others it was very rough. I think it’s a factor of both the hardness of the wood and the width of the blank I’m cutting. This cut in a piece of ~8″ wide eastern walnut was typical. After slicing a number of samples I realized I really needed to surface it after each cut so that I always had a smooth face in each slice. I ended up cutting up a bunch of odd bits. 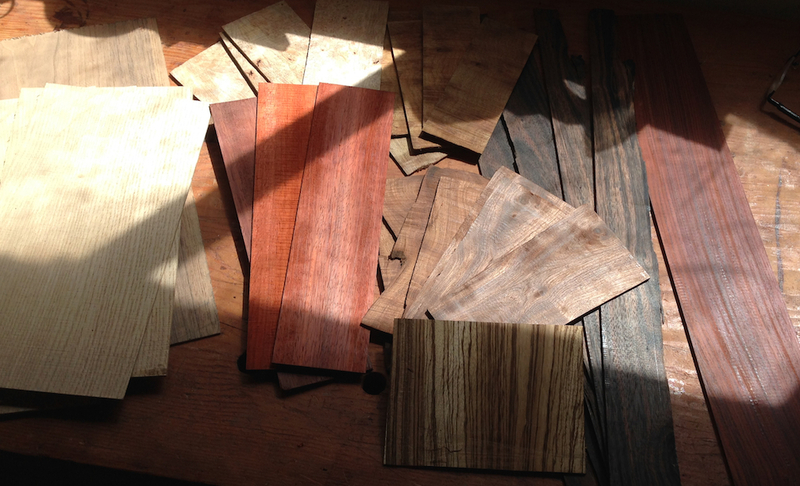 Some were interesting samples I’d picked out of the discount bins at the lumberyards, a couple were turning blocks I’d had sitting around for years, and a couple were offcuts that were too interesting to pitch. One, the Camphor Burl, smells so wonderful when it’s cut that it makes me smile to think about it. It’s somewhere between licorice and root beer, and almost medicinal. Back in my previous woodworking phase I made a Krenov-ish cabinet in Canary wood and Spalted Maple for my parents, I fitted it with a drawer in Camphor wood which I left raw on the interior. When I milled that bit I was up to my knees in Camphor chips and it was nearly a religious experience. 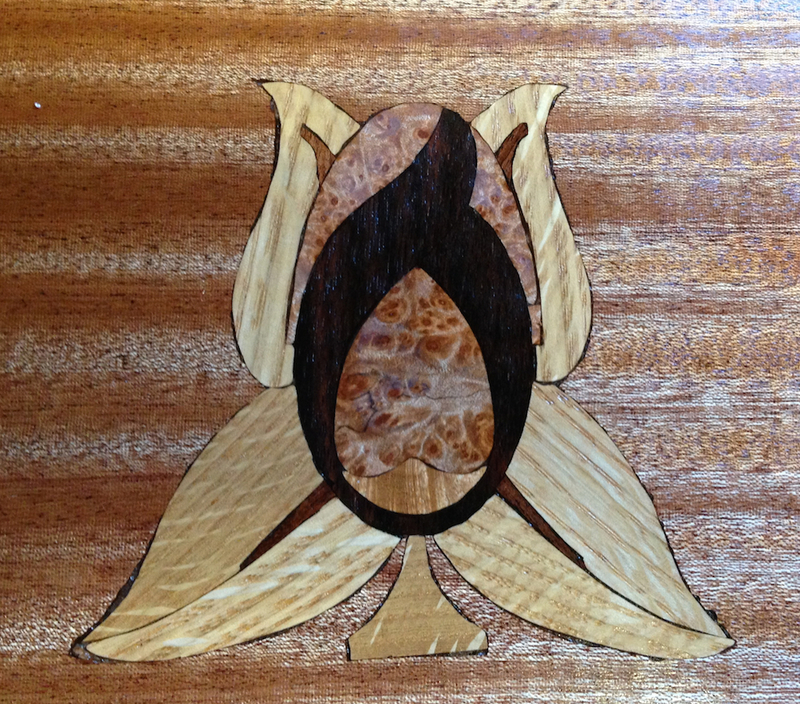 I decided to use the White Oak, Birdseye Maple, Mesquite and Macassar Ebony for the inlay. 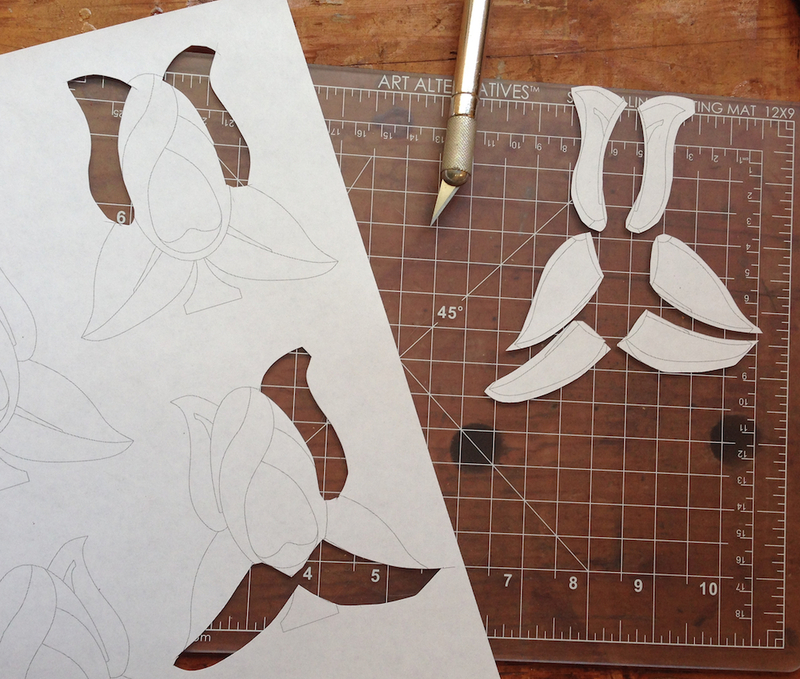 I cut individual pieces out of my patterns — cutting outside of the layout lines for each piece. 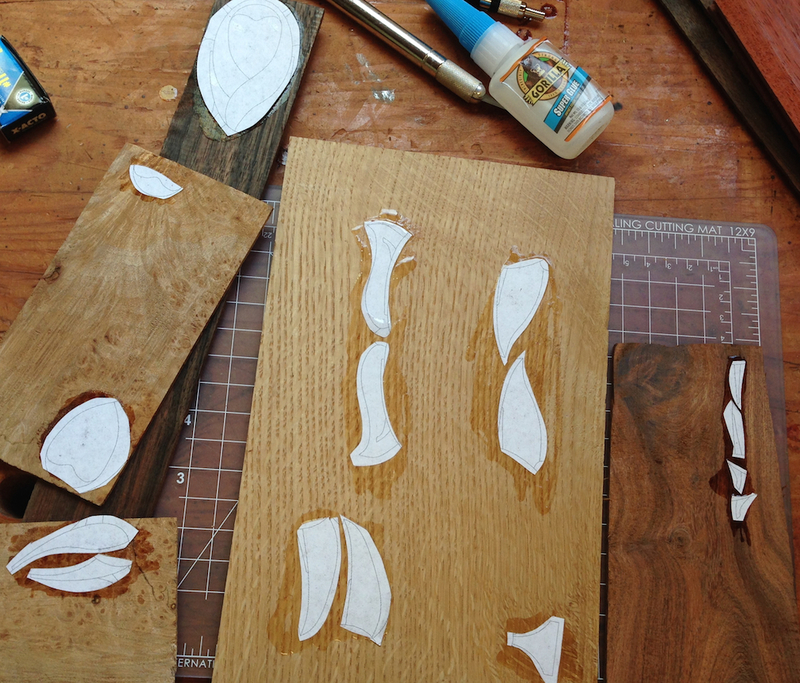 Each individual pattern is then super-glued to a piece of wood. 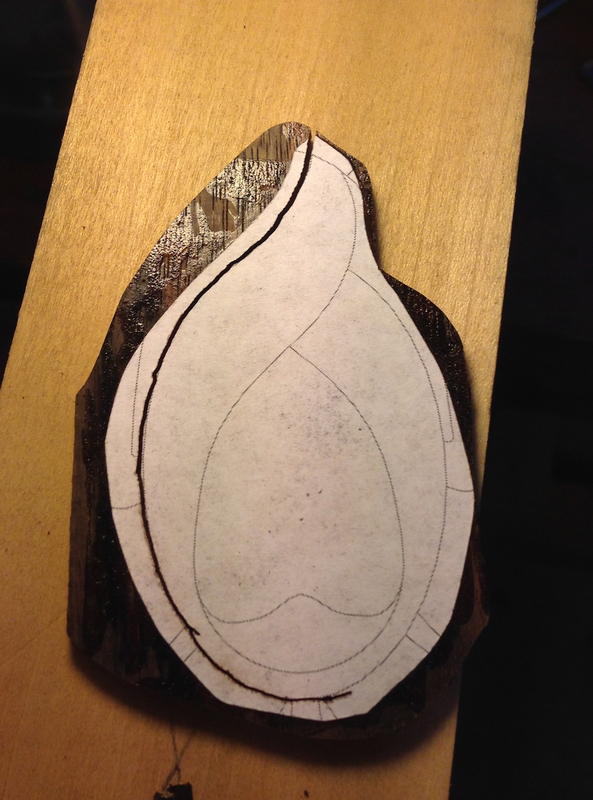 I used one pattern to map out which section of the inlay gets which species of wood as a cheat sheet. As I was gluing the pattern pieces I tried to orient them in an interesting way relative to the grain or figure in the wood. Everything up to now was pretty simple, this next step is what I’ve been most concerned about: Sawing Out! 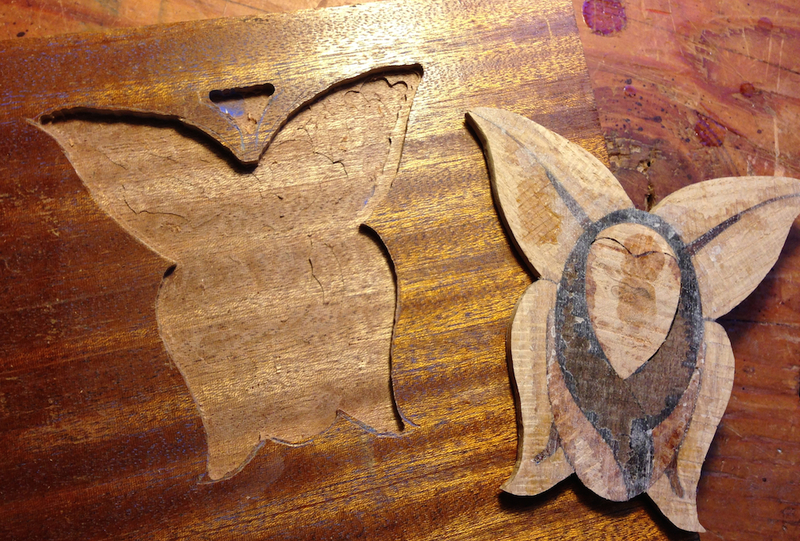 I tried using a scroll saw to cut these pieces, even with a fine blade and a slow speed I wasn’t getting good results. I couldn’t follow the line accurately. The articles I’ve read and the videos I’be watched say that you should saw half the line away. OMG, really? I can barely follow the line, much less split a line that fine. 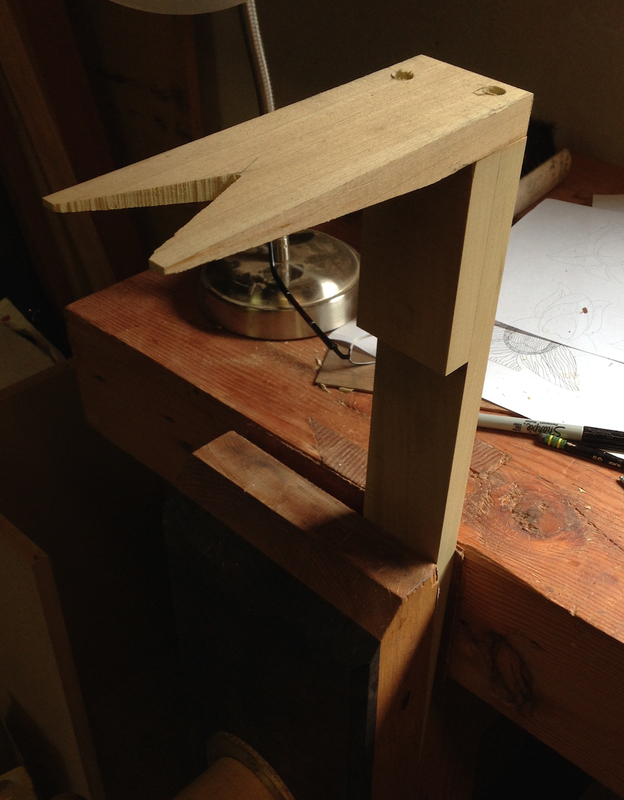 Abandoning the scroll saw, I made up a saw support that I can clamp in my face vise. It’s tall enough to position about chest high (when I’m sitting) or a little higher. In the Larry Robinson inlay video I watched he has a vacuum attached to the saw support so he doesn’t breathe the Pearl dust. I need to rig something like that up, because the wood dust covers the line with each stroke of the saw, and I’m hyperventilating from puffing the dust away so I can see the line. I’m also using a #5 Optivisor so I can see the line (in fact, I can see the pixels from the printer). 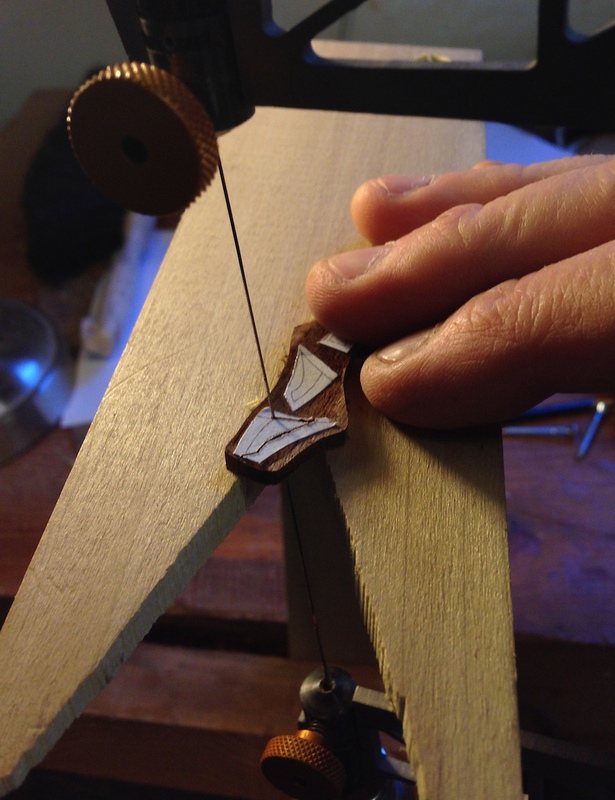 I’m sawing the pieces out with a 3/0 (“three-aught”) jewelers saw in a Knew Concepts saw frame. It’s a 64tpi blade, and it’s unbelievably fragile. I snapped about 4 blades in a row trying to get the tension right. The only other blades I have are too coarse (15tpi), so I’ll order some other blades this week. I’m going to try a #3, 45tpi blade, and see how that works. It is actually pretty fact to saw out a part by hand, it’s just the accuracy that I’m struggling with. I can almost follow the line, as long as I can see it. The saw isn’t as hard to steer as I remembered from when I’ve tried to saw parts like this in the past. But I still get a lot of little wiggles along the cut, and I expect that this inlay, when finished, will look a little sloppy. Maybe a lot sloppy. I’m deciding right now that I’m OK with that — this is a practice piece to start learning the technique. I’ve had to re-saw several pieces already. A couple of pieces broke as I was filing off some of the hiccups in my sawing. One of the thing mesquite pieces flipped off the saw support and disappeared (I suspect it was actually an alien abduction), and a couple were just too sloppy. So, cut more patterns, glue them down to more bits of wood and saw again. I’ve started fitting the bits together, but I have a few more pieces to saw out. I’m going to head out to the shop in a few minutes to finish sawing out the parts and move on to the next steps. I’d like to see this done today so I can get a feel for what I need to work on (besides sawing). Starting to fit the cut pieces together. It doesn’t look very interesting with the paper still on it, but that is four different species of wood.